Hundreds of people have marched through the streets of Vicenza to protest against “the continued existence” of the “Dal Molin” US military base located near the northern Italian town. The protesters gathered at the central Piazza Matteotti square around 15:30 local time (14:30 GMT), where they staged a rally under the slogan “no to war.” The demonstration was organized by the 'Presidio No Dal Molin' movement which opposes the presence of US military bases near Vicenza and across Italy. The organizers put the number of demonstrators at about 700 people, while police said no more than 500 attended, local media reports. Anti-war activists, mainly from the provinces of Italy’s northern Veneto region, also joined the demonstration. The protesters also shouted “Trump go home” and expressed solidarity with other protesters around the world who took to the streets to show their discontent with the new US president. The event was peaceful with no incidents reported, local media said, citing police. The US “Dal Molin” base has been a source of controversy for quite some time. 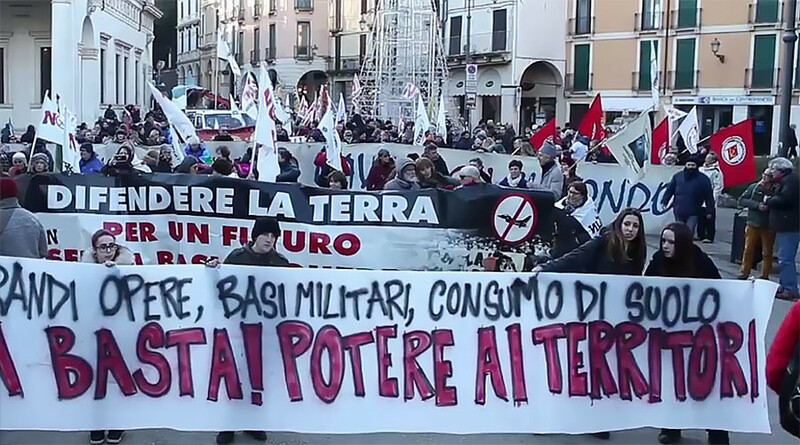 In November, about 200 people gathered in Vicenza calling on Washington to “free” their soil from the US military presence on the day of the US presidential election. The November protests ended up in clashes after around 50 people separated themselves from the main group and started throwing firecrackers onto the base. Police used tear gas to disperse the crowds but no one was injured in the fracas. Italy has one of the highest numbers of US foreign bases in the world, and is the second-largest state in Europe - after Germany - which has an American military presence.